I'm a huge fan of chocolate, and it's even better when it comes in baked form! I first fell in love with the Sachertorte when I saw it being made on "The Great British Bake Off", and instantly wanted to try it. I came across Mary Berry's recipe after searching and tried it out. The photo above is my first attempt. I was pretty pleased with it despite my slightly wonky piping! After trying my first slice, I was even more in love with this fabulously dense, chocolatey torte. The hint of apricot under the ganache seems to sing against the bittersweet chocolate. I've made it quite a few times since, and every time it reminds me just why it's my favourite chocolate treat! I've used Mary Berry's recipe every time, with no additions or alterations. You can't improve on perfection! Although, I must say, I've been tempted to put half of the almonds in lately and substitute the rest for ground pistachio... I'll let you know if I do try it! Mary Berry's recipe can be found here on the BBC Good Food website. At the end of stage 2, Mary quotes that the mixture will be quite thick. Mine is usually very thick here, until I mix in some of the egg whites as detailed in stage 3. The reason why only a small amount of egg white is added to start with is to enable the mix to "slacken". This, in turn, makes it much easier to fold the rest of the egg white in. My arm is usually quite achy before all of the egg is folded in! Once all of the egg whites have been added, keep folding gently until there are no more white bits left. This will ensure the consistency is correct. In stage 5, once I've warmed the apricot jam in a small pan, I usually pass it through a sieve to remove any pulp. This way, I've found it easier to get a nice smooth layer for the ganache to cover. The process laid out in stage 6 is now the only way I make ganache. It turns out perfect every time, and I don't have to worry about trying to microwave chocolate, or adding cold cream to melted chocolate. The ganache needs to be cooled before using, but be careful not to over-cool it! It needs to be fluid enough to coat and run down the sides, but not too fluid so that all of the chocolate slides off. For the piping, I found it much easier to make a small bag from greaseproof paper, as I've previous struggled with a burst bag when using such a small amount of chocolate. I'll go over directions to make a piping bag at a later date. Before piping on the torte, you may want to have a few practice goes on a piece of greaseproof paper. There's plenty of chocolate to allow for a few trial runs. The easiest way to move the torte from the rack onto a board or serving plate is to use a couple of pallet knives. Wait until the ganache has set before moving it though! I recently made another Sachertorte for "Children in Need". The company I worked for held a bake off event to raise money for the charity. To maintain the glossy finish, the torte needs to be stored at room temperature. If you put it in the fridge, it clouds over and loses its sheen. It's such a fantastic tasting torte, and the recipe is nice and easy, so I do hope you'll all be brave enough to give it a go! 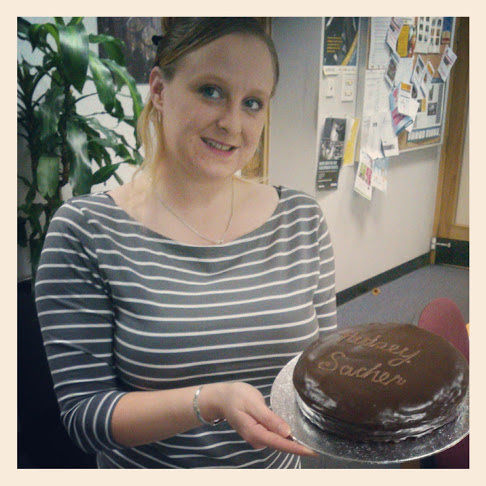 Me with the Pudsey-Sachertorte at work for Children in Need. Thanks to Toby for taking the photo! 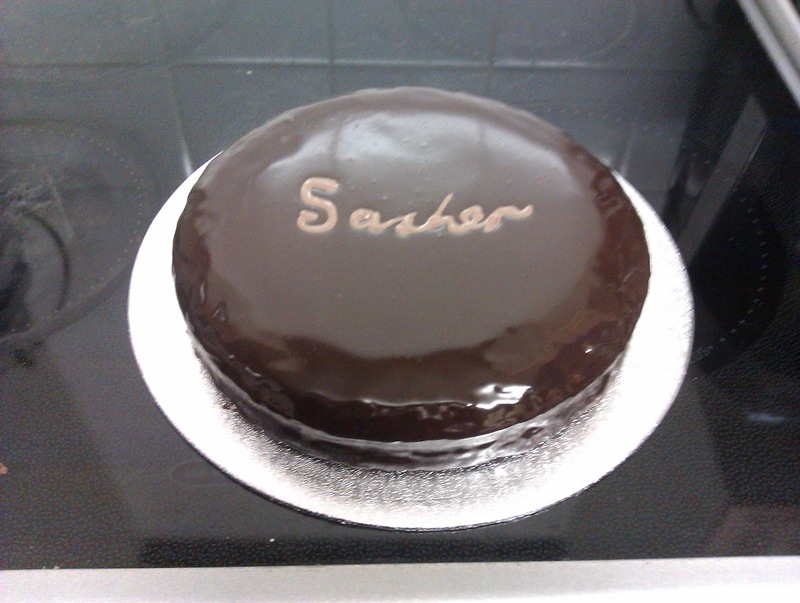 I have never tried to make a Sacher torte, the writing bit makes me nervous. It makes me think of the poor contestant who spelt it wrong on Bake Off !! I must look into getting a cake lifter - thank you for the recommendation! This is on my 'to bake' list alongside a Fraisier Cake. Love the shine on yours, could just eat a slice now. I love Sachertorte, and I've no idea why people are worried about baking it - it's really not as difficult ad people make out! Never heard of Fraisier cake, must have a look! Hiya kate, just found your blog its lovley! that sacher looks delicious. I was watching the masterclass when they made this Mary kept saying it was dense....how did you find it? Im thinking of giving it ago. The Sacher is very dense, but Mary's recipe is very moist too so it balances well with the density. The little bit of apricot jam is just fantastic too!